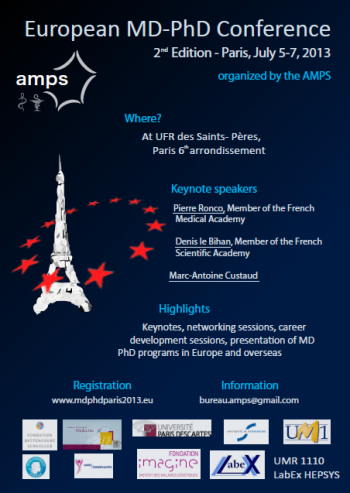 The 2nd European MD/PhD Conference was held at the Université Descartes in Paris, France. The French national MD/PhD organisation expertly hosted the conference. With esteemed keynotes such as Dennis Le Bihan, Pierre Ronco and Marc-Antoine Custaud and many others, the conference provided ample scientific insight and depth. Besides student presentations and posters, the social programme also allowed for a lot of fun. Last but definitely not least, the culinary preparations of the 2nd European MD/PhD Conference will surely be remembered for many years to come.